If you don’t know how to eat guava correctly, this article from AidBird is for you. Guavas have a particularly high content of vitamin C. Guava is a tropical fruit that is about the size of a tennis ball. Depending on the variety, its color may be light green or yellow. When ripe, the pulp of peeled guava has a reddish color, and the flavor is sweet and refreshing. Whole fruit has between 50 and 112 calories and contains many nutrients, including vitamin C, potassium, dietary fiber, vitamin A and folic acid. Although you can find them throughout the year in the United States, their peak season is in summer. Raw guava is one that has not finished ripening, that is, it is hard and very green. Although the color of the guava goes from light green to yellow, if it is gently pressed when it is pressed, it means that it is already at its point to be consumed. Like all fruit, it is not recommended to eat it raw as it can cause stomach problems. You always have to wait for it to mature, because that way you take advantage of all its beneficial properties for health. Eating guava is very easy. Here we describe how to eat guava. If you don’t know how to eat crawfish, you are welcome to the article about eating crawfish. Rinse a guava under cold running water, without using soap. Cut the bruised areas with the tip of a paring knife. Cut the guava crosswise, in half. Use the teaspoon to remove the seeds from the center of the fruit. The guava is ready to eat it. Serve the guava with cream or yogurt or cut it into pieces to add it to a fruit salad, with slices of orange, slices of banana and other fruits. Ripe the guavas by placing them on the countertop of the kitchen until they are slightly soft. Store the ripe guavas in the refrigerator for up to two days. The guava is easy to freeze and it is better to do it with those that are slightly acidic. Wash, peel and cut the fruit in half and remove the fibers and seeds with a spoon. Place the fruit in an airtight container and then cover it with a sugar syrup. Place the lid on the container and freeze it. Frozen guavas are kept for up to eight months. Guavas are good for a wide variety of dishes including pies, puddings, cakes, jelly, condiments, sweet and sour preserves, jams and sauces. Whenever we hear about vitamin C we think about orange, what very few know is that there is a delicious fruit that contains about four times the amount of vitamin C than an orange. Discover the truth about guava and its many benefits. Guava is very useful to lose weight without compromising your intake of protein, vitamins, and fiber. This fruit is very high in fiber and rich in vitamins, proteins and minerals have no cholesterol and contain a low number of digestible carbohydrates. It is a very abundant appetizer and satisfies the appetite very easily. The guava especially raw has less sugar compared to other fruits. The addition of medium size guava to your lunch makes you feel hungry until night. Guava is very rich in astringents of alkaline nature that have disinfectant and anti-bacterial properties, which helps reduce the symptoms of diarrhea and cure dysentery (inflammatory bowel disorder, especially in the colon), by inhibiting microbial growth and encourage the removal of excess mucus from the intestines. On the other hand, guava nutrients such as vitamin C, carotenoids and potassium, strengthen and tone the digestive system and at the same time disinfect it. Guava is also beneficial in the treatment of gastroenteritis. One of the most famous and important advantages of the addition of guava to your diet is its ability to inhibit the growth and metastasis (the spread of cancer from one organ to another) of cancer cells. Prostate cancer and breast cancer (thanks to lycopene, a potent antioxidant) and oral cancer are some of the cancers that help prevent guava. Guavas are good sources of vitamin A, known as a booster for the general health of the eyes. This fruit can help reduce the appearance of cataracts, macular degeneration and even an improvement in the vision once it has begun to degrade. Guavas are a good source of copper, which is an important part of regulating thyroid metabolism, helping to control hormone production and absorption. The thyroid gland is one of the most important glands in the body to regulate hormones and the function of organs and systems, so guava can help balance your health in many ways. Another truth about guava is the presence of vitamins B3 and B6. Vitamin B3 (also known as niacin) can increase blood flow and stimulate cognitive function. Vitamin B6 is a great nutrient for nervous and cerebral function. 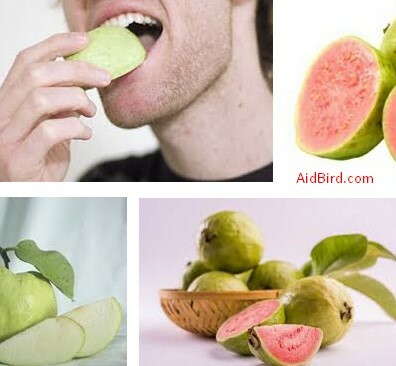 Therefore, eating guava can help increase brain function and improve concentration. Due to its high content of vitamin C, guava is very useful to relieve coughs and colds, reducing mucus, disinfection of the respiratory tract, throat, lungs, and inhibition of microbial activity with its astringent properties. Guava helps reduce blood cholesterol and prevents thickening, thereby maintaining blood flow and reducing blood pressure. It is important to know how to eat the guava. Some people don’t know the right way to eat the guava. Few don’t wash it; few remove the outside of the fruit which is full of vitamin C. On the other hand, it can be consumed cooked in tea, punch, jam or syrup. And in all, the guava provides a delicious flavor. Eat 3 pieces a day, do it on an empty stomach or between meals. You will see how your health will be rewarded.